ATTENTION: The DMV requires any applicant taking a Written or Driving exam must present a pre-registration code. You will apply for this code at: mydmv.colorado.gov. This includes all students wanting classroom education as well as Behind the Wheel instruction. We provide long-standing, top-notch driver education coupled with the flexibility necessary for today’s busy families. No appointment necessary – Walk-Ins Welcome! They’re Super nice and friendly! Best of all, they work super fast!! EXCELLENT over all service! Very punctual and professional! They make sure you are prepared to drive in the city. I had to take few driving classes with automatic car, the car's they use to teach you are brain new, easy to drive and get used to. He is concentrated to make you understand the signs and crossing lines and how to shift safely and become SAFE driver! It's important when someone care to make sure you are becoming a careful and safe driver! I definitely Reccomend this DRIVING school! They provide classroom gor teenagers and if necesary he will draw on paper to make you understand how you parallel parck,shift lines, and so ON! I Reccomend this school because it's a brilliant example of personalized service: they make you work on your weakest point's and make sure you are comfortable! Great!!! Shantal was awesome!! Helped me understand the directions she gave me. 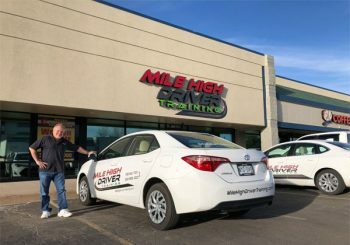 I would highly recommend Mile High Driver Training; they were extremely professional and supportive through this process. I am an expat who needed to organize my Colorado licence and they were very informative and helpful in getting this entire activity completed in a few hours. I would encourage anyone to go to this team for a seamless and positive experience, especially those moving to Colorado internationally. Thanks again for all your help! I was scared retaking my drivers test. I failed before for speeding in a school zone. Shantal told me to me confident in my driving, that made my nerves go away and i passed! Our driving school offers affordable driver’s education courses. 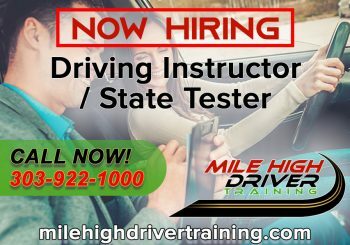 Mile High Driver Training is the largest third-party testing center and driving school in Denver, Colorado. Our driving school offers affordable driver’s education courses online, in a classroom, and behind the wheel for teens and adults. Call now! We are here to serve you and give your new driver the very best driver education possible. We are not a corporate-owned company or franchise. Mile High Driver Training is a family-owned business managed by three generations of family members. We all have kids and grand kids and understand the importance and necessity of training new drivers to be safe drivers.